Formation and Sampling of the Retinal Image: Introduction. Formation of the Retinal Image. Neural Sampling of the Retinal Image. Optical versus Sampling Limits to Vision. The Receptive Fields of Visual Neurons: Introduction. Receptive Fields of Retinal Ganglion Cells. Visual Cortex. Spacial Vision: Introduction. Single Neurons and Behavior. Window of Visibility. Optics and Photon Noise. Retina and Lateral Geniculate Nucleus. Primary Visual Cortex. Implications for Object Recognition and Scene Interpretation. References. Color Vision: Introduction. Physiology. Chromatic Discriminations and Their Physiological Bases. Color Appearance and Its Physiological Bases. The Role of Color in Spatial Vision. References. Binocular Vision: Perceived Visual Direction. Binocular Correspondence. Binocular Sensory Fusion. Encoding Disparity: The Matching Problem. Stereoscopic Depth Perception. Occlusion Stereopsis. Binocular Suppression. Seeing Motion: Overview. Representing Image Motion. Analyzing Direction of Motion along a Given Axis. Integrating Motion Signals from Different Axes. Second-Order Motion Mechanisms. Conclusions. The Neural Representation of Shape: Introduction. Organization of the Ventral Pathway. Physiological Properties. Attention, Learning, Memory, and Motor Signals. Computational Principles. Current Research in the Neurobiology of Form Vision. References. Visual Attention: Introduction. Vision before Attention. Vision with Attention. Vision after Attention. Vision without Attention. Conclusion. References. Index. One of the most remarkable things about seeing is how effortless this complex task appears to be. This book provides a comprehensive overview of research on the myriad complexities of this task. Coverage includes such classic topics as color, spatial, and binocular vision, areas that have seen a recent explosion of new information such as motion vision, image formation and sampling, and areas where new tools have allowed a better investigation into processes (e.g. neural representation of shape, visual attention). 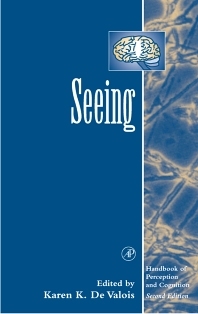 Seeing is a needed reference for researchers specializing in visual perception and is suitable for advance courses on vision. Academic researchers in perception, and cognitive, physiological, and biological psychology.